Heat the oven to 375°F. Beat the egg yolks and water in a small bowl with a fork. Sprinkle the flour on the work surface. Unfold 1 pastry sheet on the work surface. Roll the pastry sheet into a 16-inch square. Brush the pastry with the egg mixture. Cut into 16 (4-inch) squares. Repeat with the remaining pastry sheet. 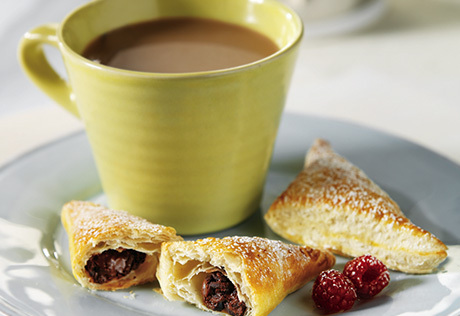 Place 1 teaspoon chocolate pieces in the center of each pastry. Fold the pastry over the filling to form a triangle. Crimp the edges with a fork to seal. Prick the tops of the pastries with a fork. Brush the pastries with the egg mixture. Place the pastries onto 3 baking sheets. Freeze for 15 minutes or until firm. Bake for 15 minutes or until the pastries are golden brown. Sprinkle with the confectioners’ sugar. Flavor Variation: For Chocolate-Raspberry Pillows, place 1 fresh raspberry with the chocolate pieces in the center of each pastry square before folding and baking as directed above.